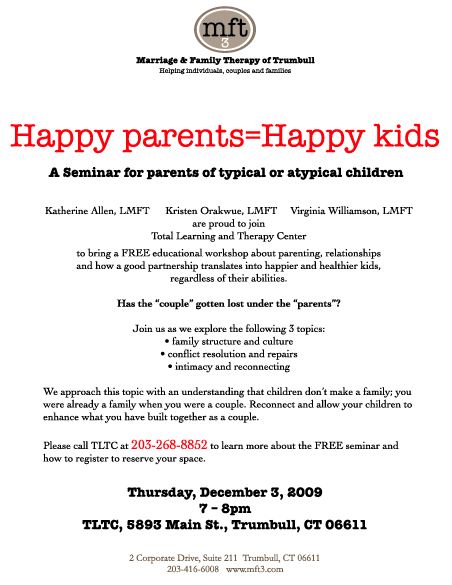 Join MFT3 as we present a free workshop on December 3 from 7-8pm at the offices of Total Learning and Therapy Center in Trumbull, CT. We will explore three topics; family structure and culture, conflict resolution and repairs, and building intimacy and reconnecting. Registration is required so please call 203-268-8852 if you are interested in attending this free workshop. 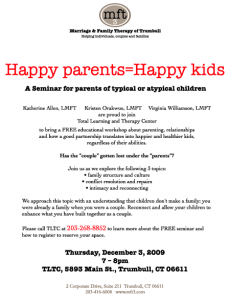 This entry was posted in MFT3 News, Parenting and tagged conflict resolution, family, free workshop, kids, reconnect, relationship. Bookmark the permalink.